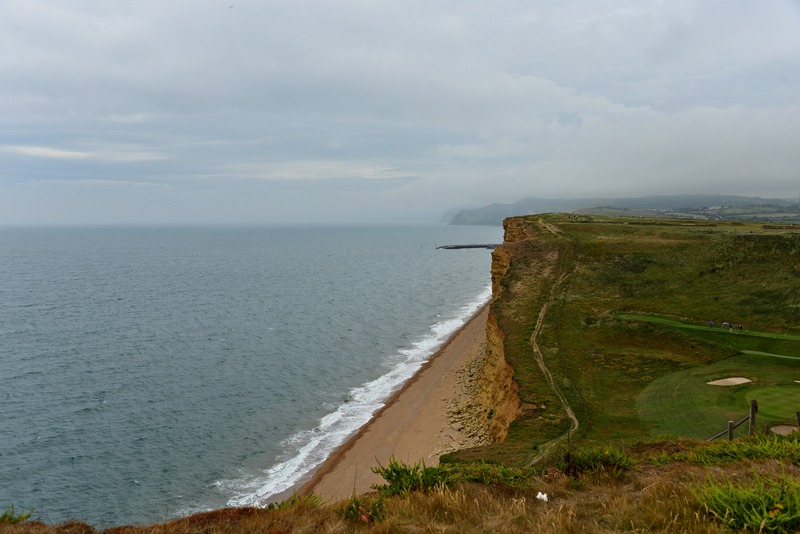 Fancy a weekend away in Thomas Hardy’s beautiful Dorset, England’s southwest? 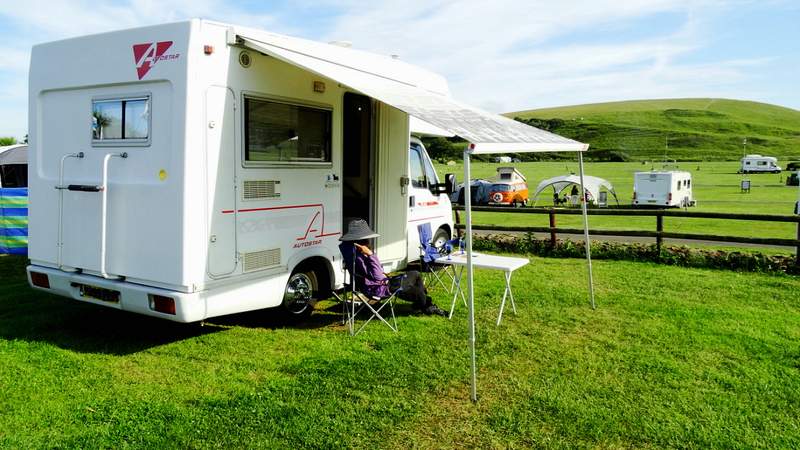 Armed with Reg the new (older) motorhome, a drive to Burton Bradstock is a great test run before the next big 3-month European adventure, starting in France. This part of England is going to be the new playground and shakedown for frequent get-aways, as it’s an easy 1.5-hour drive from Street (Somerset). And with fuel at around £1.19/litre, you don’t need to take out a mortgage for the trip. 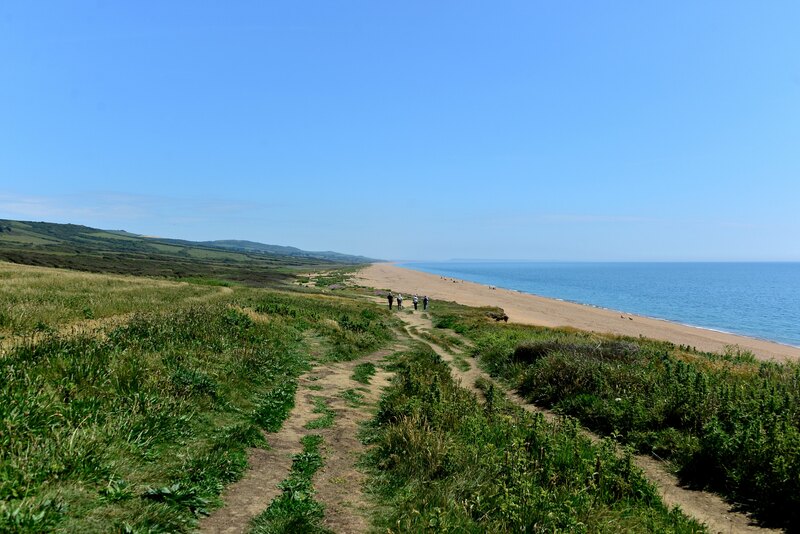 The campsite also includes everything that you can possibly want, with the added bonus of many walking trails along this stunning and renown coastline. 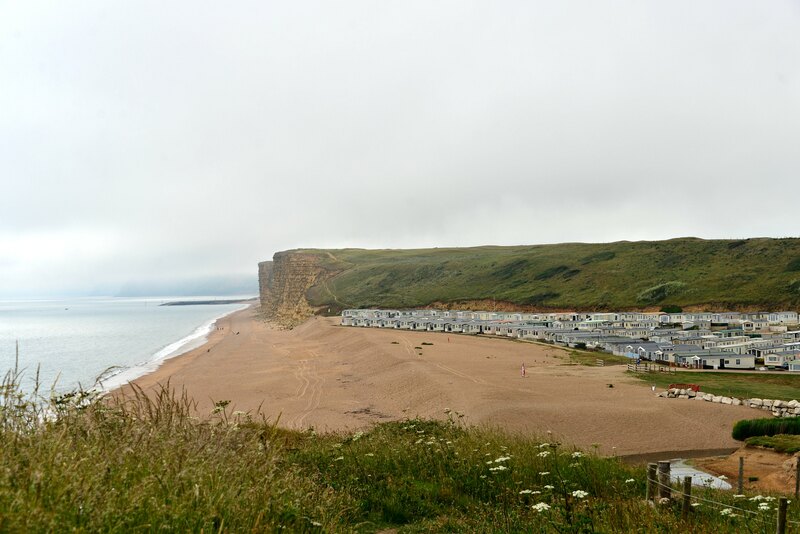 Take a stroll along the spectacular Jurassic Coast to West Bay, which is about an hour from the campsite. But beware, there are a few pretty steep hills along the way. Steps and the occasional bench makes it a little easier to get your breath back if you need to stop. You can walk most of the 96 miles (154 kilometres) of this World Heritage coastline if you so wish or feeling energetic. 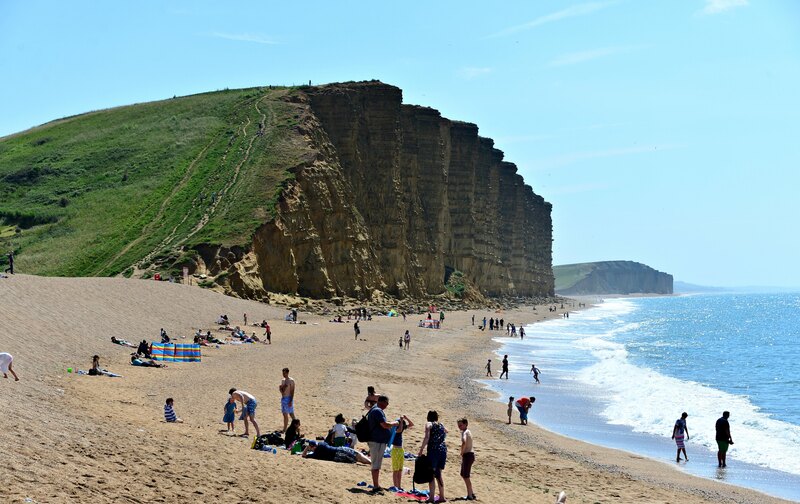 The layers of sedimentary rock reveal 85 million years of Earth with soaring cliffs as high as 660 feet (200 metres) in this spectacular part of the UK, doesn’t disappoint. With such wonderful vistas, a great campsite, and history to match, you can see why this area is a big hit with local and foreign tourists year-round. Great photo opportunities wherever you look and especially if the weather is sunny and kind, which it is on a this occasion. 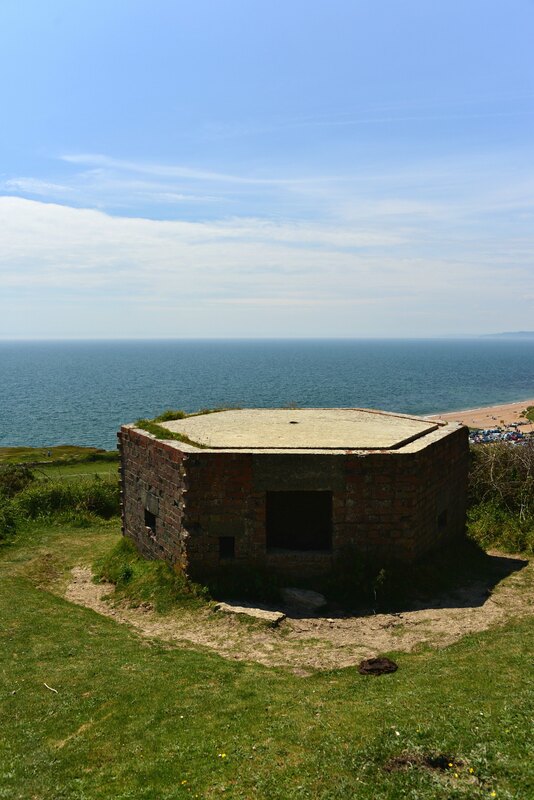 For the history buffs out there or if you’re interested in a little history, just up the hill near the Freshwater campsite and not a strenuous walk, you’ll bump into remnants of WWII Pillboxes, which were constructed in the early 1940s. 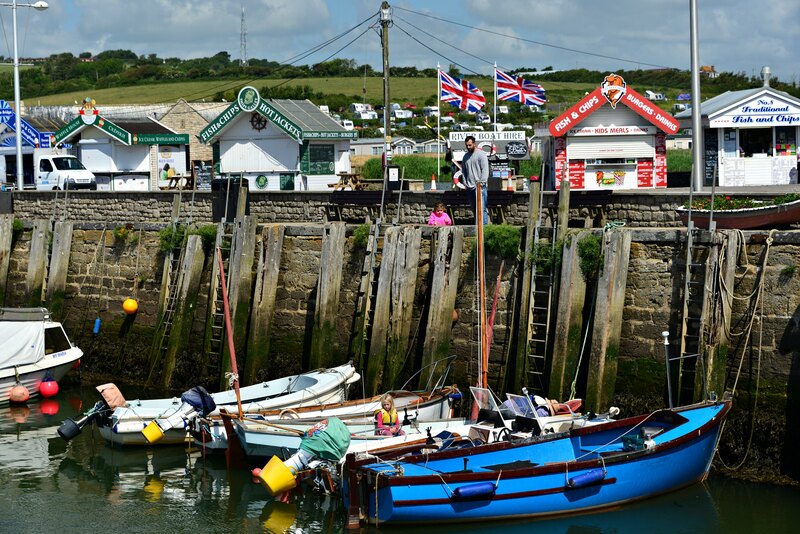 Once you walk from the campsite to West Bay taking loads of photos and enjoying nature, you’ll need a snack break – what better surrounds than to stop at The Customs House on 9 West Bay Road. Not only is there bistro dining, restaurants, antique and contemporary handmade art from creative traders, it’s worth spending a few hours wandering around the 3 floors of this beautiful 200-year old building. Within close proximity to the sea and the sound of water, it’s a cool spot just to relax. 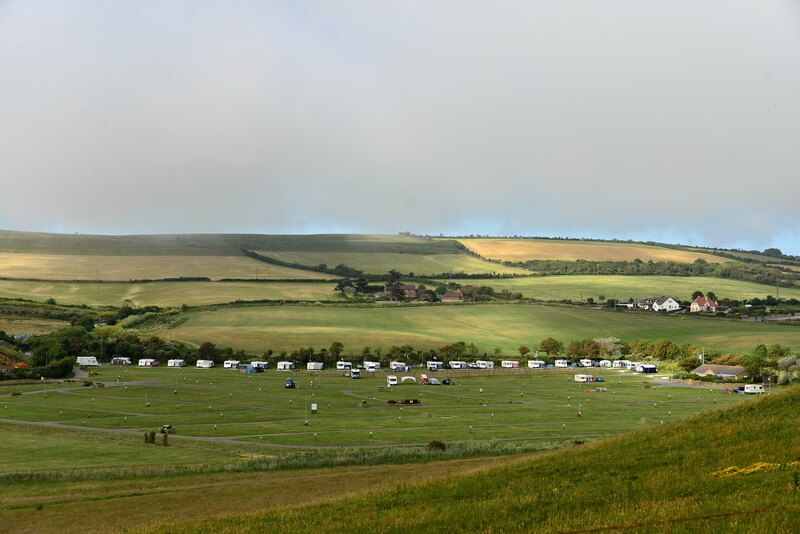 Facilities – This is a family park spread over 20 acres with over 400 pitches (I think), fantastic facilities, excellent staff, and a great position by the sea. A 5-Star complex. A pool (not open in low season), restaurant, shop, fun centre, bar, dog walking area, and much more keeps you busy and the kids happy for a while. And, a fabulous spot to relax and go for lovely long walks. The campsite also offers several spotless ablution blocks thrown in for good measure and heavenly in which to shower. The first adventure to this campsite is over a Thursday/Friday night during low season. Although Thursday proves quiet, Friday afternoon is different. A steady procession of cars towing caravans, motorhomes, campervans, and more, drive up and down the site searching for their pitch number. Finally finding the one, spill out onto the pitch with adults, children, camping gear, and start erecting tents, awnings, and other stuff for the weekend – great to watch the social interaction. Some turn into heated discussions on why the tent isn’t quite right, straight, or other, which eventuates into arguments, and one person finally giving up and stomping off! Also amazing is the incredible amount of gear people ram into their vehicles to take away just for a weekend. It seems that nothing can be gone without for a couple of days and all creature comforts are required at hand. 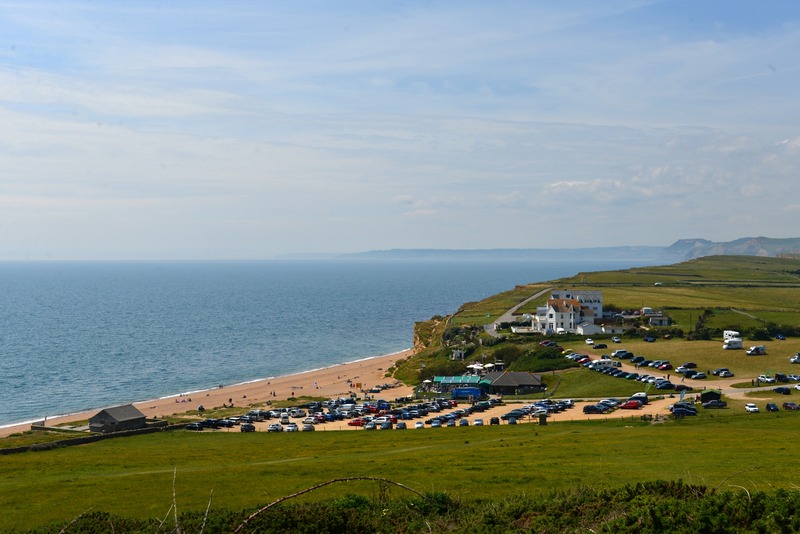 From the campsite, there are excellent coastal treks/walks east to Burton Bradstock – check out Hive Beach Cafe – and west to West Bay village (check out The Customs House). Gorgeous spot for a golf course! 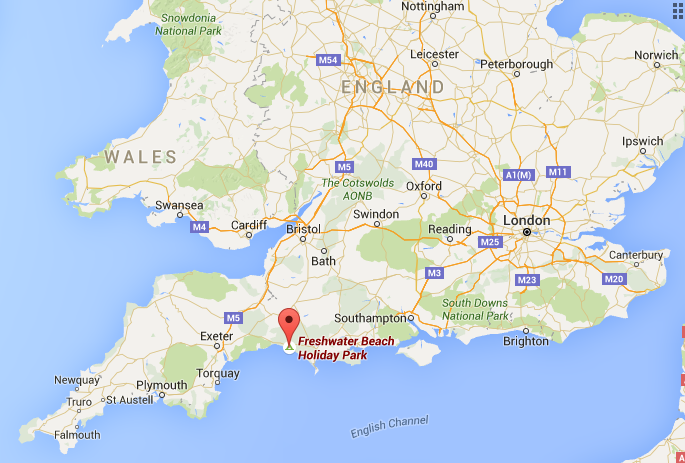 …why not enjoy a spot of beach fishing to catch your own dinner and throw it on a BBQ. Sip on a glass of bubbly while you wait for your meal to arrive and watch the sun go down? 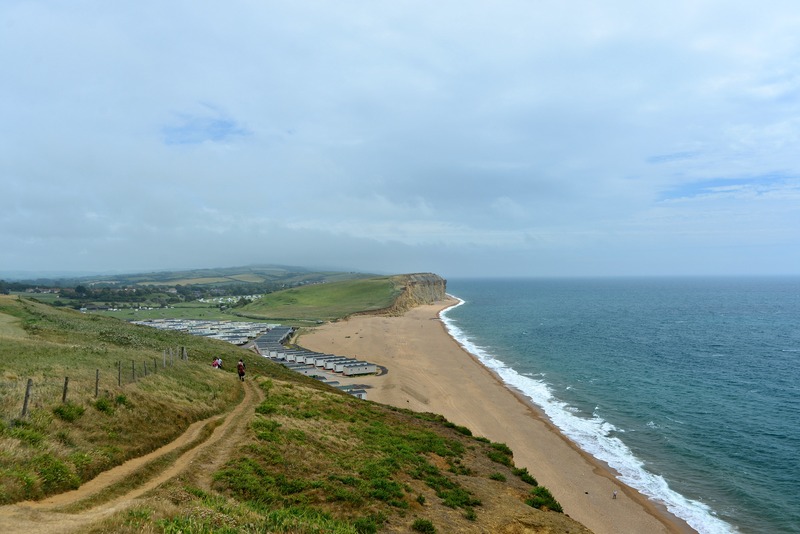 West Bay beach – note coastal trail up the cliff back to Freshwater campsite! Loads of great dining and cafes on offer in this part of the world. 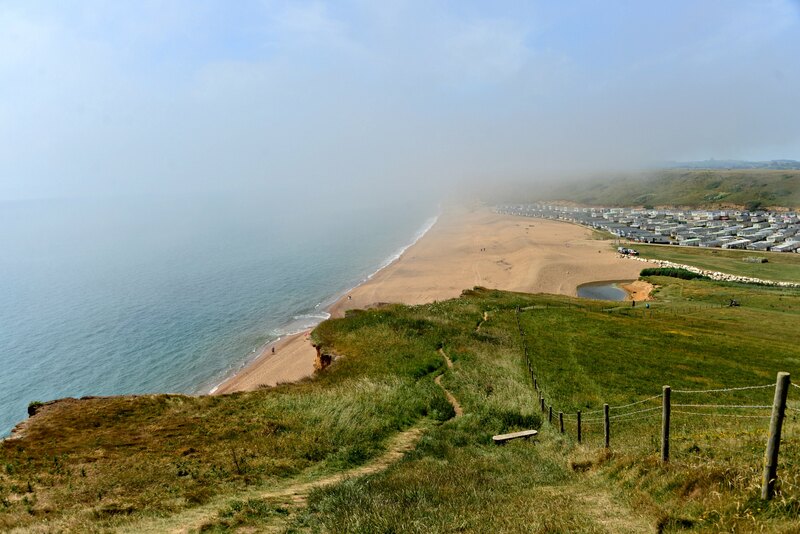 Hive Beach Cafe is in a gorgeous location and lovely place to stay for a drink whilst watching the calming sea. A seafood meal costs around £17.50-£25, coffee starts at £2.20, and £2.25 for an ice-cream cone with a Flake stick stuck on top. Meals are pricey but I’m sure they’re very good as the aroma from the cafe is great, but on the Aussie dollar all prices are double, so a little expensive for the daily budget. 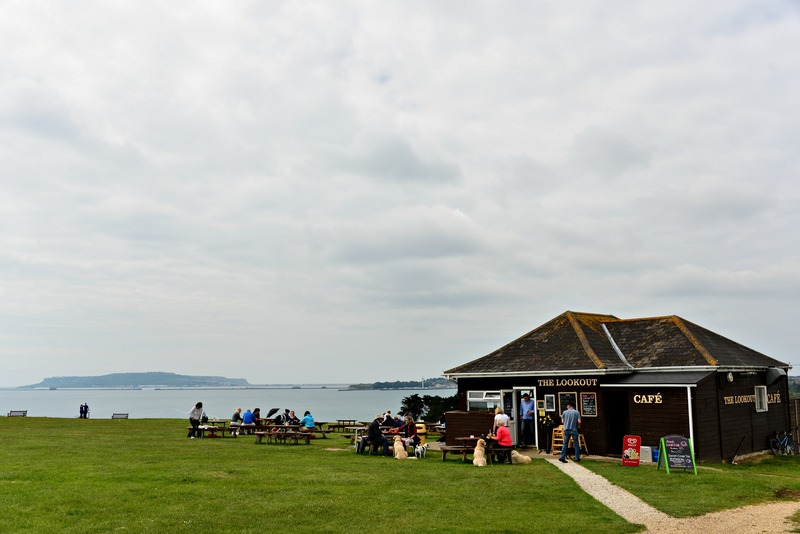 At Bowleaze Cove in Weymouth, this cafe offers fantastic views of Portland Bay (to the west) and along the Purbeck Heritage Coast (to the east). A relaxed atmosphere but this cafe is very busy on a Sunday morning. Pop in for a delicious breakfast (£6.25-£8.25), coffee (£2.05-£2.65), or stop for lunch with a burger or main (£8.25-£8.95). Snacks, homemade cakes, and light bites are also served. 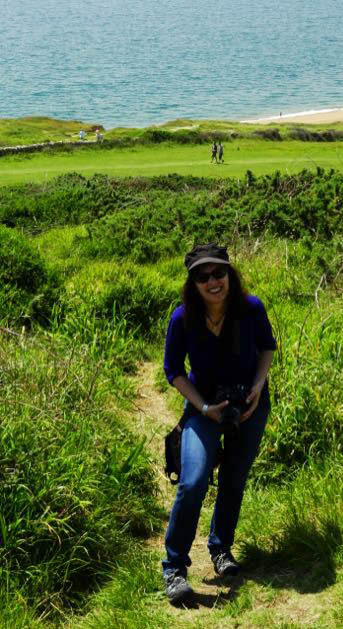 On one of the many glorious coastal walks! On 57a The Esplanade (Weymouth) this cafe is a great spot for scrumptious gourmet sandwiches, coffee, Devonshire teas (£4.00), and homemade cakes. Great service and ambience – excellent staff. Stroll along Brewers Quay until you bump into thi great Italian kitchen offering a lovely ambience, great service and food (Starters £3.95-9.95; Mains £7.65-£17.95; Pizzas £7.95-£12.90). Try the Linguine allo Scoglio – simply scrumptious! I hear the pizzas are also pretty special. Visit my Nilla’s Photography for more images. More posts on Touring England. I like beach on the first picture but road seems little dangerous(because snakes). Camp in Dorset looks great and peacefull. On the photo where you write georgeos spot for a golf course for a second I was thinking where is golf,I do not see him. But when I see him I start laugh. You have talent for photography. I really love your photos. Snakes? You need to go to Australia for dangerous snakes. When I see that grass is that big I afraid there is a snake. I know how to react when I see a snake. I know about that there are dangerous snakes in Australia. I want to visit Australia some day. My neigbour has sister in Australia. I also love photography. I made some great photos in USA last summer. You’ll get there in the future. Hi Nilla ! I found your blog from the freshwater page. 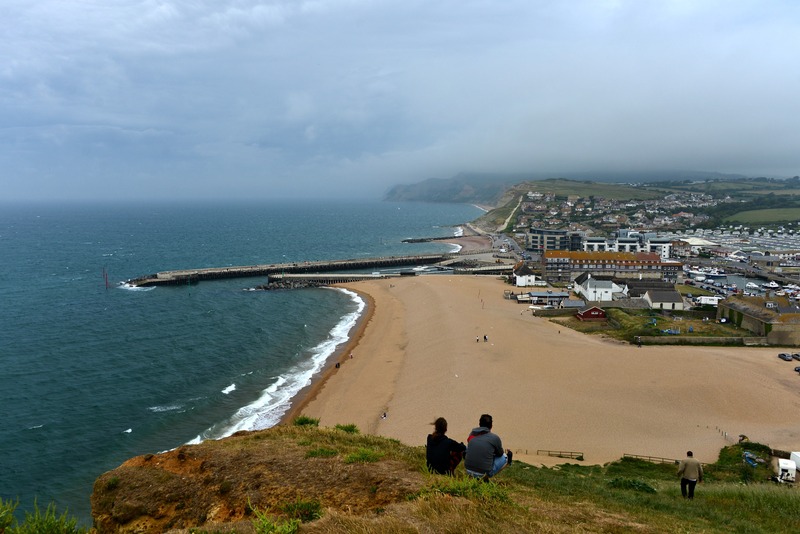 We are hoping to visit Dorset for the first time ever this summer, Your blog very informative and your pictures beautiful. Thank you, Dee Ribble Valley, Lancs. Hi, thank you for taking the time to leave me a comment and glad you found my post informative! 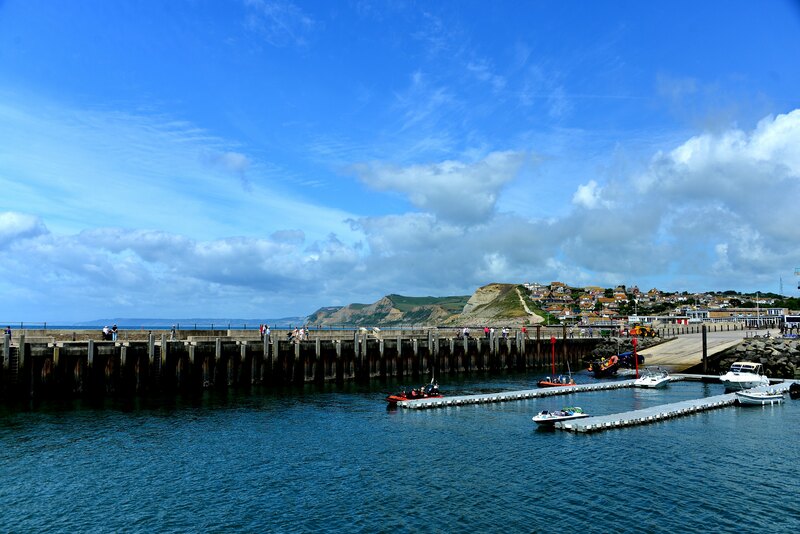 Dorset is such a beautiful part of England and so lucky the sun shone on most times we were there. 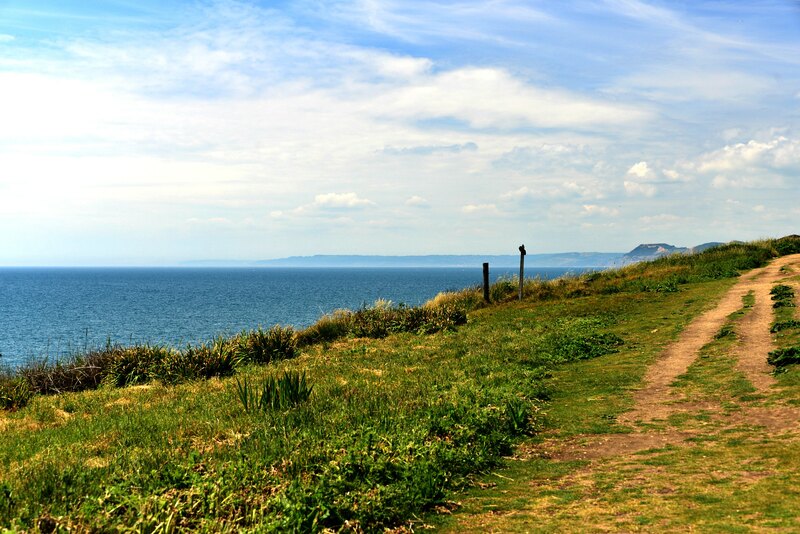 You will enjoy all the gorgeous coastal walks as they’re breathtaking! I have many moe post to upload yet. Just went back into this post and noticed one of the photos was missing so I’ve added this again.